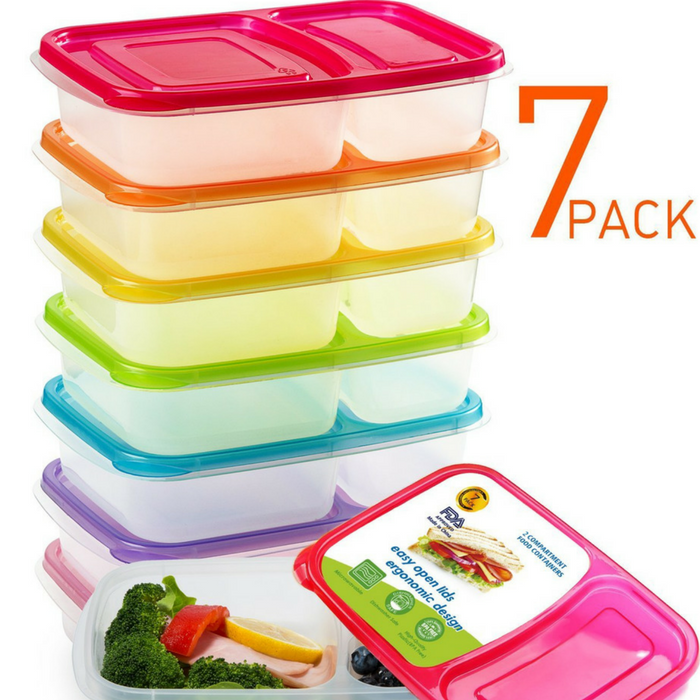 Food Containers 7-Pack Just $10.99! Down From $48! You are here: Home / Great Deals / Amazon Deals / Food Containers 7-Pack Just $10.99! Down From $48! At Amazon, you can score this Food Containers 7-Pack for just $10.99 down from $48 PLUS FREE shipping with Amazon Prime or for orders $25 or more! Designed with eco-friendly material, and easy-open lids, the lunch containers allow you to bring food to work or school and eat healthy meals. Or carry to the outside, such as picnic or travel. Your bento box containers are easy to load up on the veggies and keep the tasty indulgences to a proper amount. Dividing your food in 3 compartments helps you achieve your diet and weight-management goals. Lunch at the work place, school or trips to the park, there is Green vege Bento Lunch Containers to suit your needs. 2 COMPARTMENT BENTO LUNCH BOX CONTAINERS – 2-Compartment, great for meal prep and portion control. Each lunch container provides 2 seperate compartments, which help keep food neatly organized and prevent food from mixing together. MICROWAVE, FREEZER & DISHWASHER SAFE&STACKABLE LUNCH CONTAINERS – The bento lunch box containers are microwave-safe, freezer-safe, & dishwasher-safe. When not in use, these bento lunch box containers can be nested together to save space. ECO-FRIENDLY FOOD STORAGE CONTAINERS FOR MEAL PREPING-Made from plastic food grade pp material,the food storage containers are BPA Free, FDA Approved. So, they are safe and healthy for meal prep–pack lunches and snacks. Durable material holds up to everyday. COLORFUL LIDS, KEEP FOOD MORE ORGANIZED – Unlike other bento boxes, Our meal prep containers come with brightly colored lids. Assign a different color to everyone in the family. The colored lids make your lunch time fun and simple for all ages, therefore helping keep your food more organized. Plus, the large capacity easily holds enough food to keep off hunger. EASY OPEN LIDS, CONVENIENT TO CARRY OUTDOORS – The lids is designed to open and close easily, making the meal prep containers a great choice for young kids and busy adult. NOT LEAK-PROOF, AVOID LIQUIDS OR RUNNY FOOD. With our Bento lunch box containers, packing food is quick and easy. You can grab your lunch pack box set and go. Convenient to carry snacks and leftovers.